This is not the same as tracking a Twitter username. You can also trigger workflows when someone mentions a Twitter username you are tracking. For more information on tracking a Twitter username, see Track Twitter Usernames. Go to Settings > Integrations > Social Networks. If your Twitter login information is not cached, you will be taken to a Twitter page asking you to login to your Twitter account. 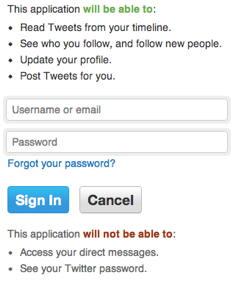 Enter your Twitter username and password in the designated text boxes and click Sign In. A grey box containing the username (aka handle) for the Twitter account will be created. At this point, Twitter access for that Twitter account is active. You can view replies, retweets, and click metrics for the messages you post to Twitter. For more information on viewing these metrics, see View Metrics About A Twitter Message. When you track a Twitter username, anyone who mentions or retweets that username will be added to your account as a contact. In some cases you may want to deactivate, or reactivate posting for a specific Twitter account. In some cases, you may want to completely remove a Twitter account you have integrated with in your account. You can stop tracking a Twitter name.